Sagging: If the ceiling sags, this is a sign that water is leaking into the building. A sagging roof is on its way to becoming a leaking roof. Dark Spots or Water Damage: Is your paint job looking old or dingy too fast? If you have ceiling tiles, are there yellow or dark spots? These are early signs of water damage, often caused by a leaky roof. Natural Light Leaks: Turn off your interior lights in the daytime and look up. Can you see any sunlight peeking through the ceiling? The appearance of light is a sure indicator of roof or tile damage. Gutters and Downspouts: These should be clear and free of blockage. Clogged gutters may mean that your roof is taking the brunt of each rainstorm. 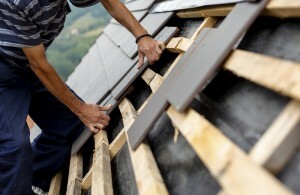 Damaged or Missing Shingles: Missing shingles are not something you should ignore. These are the first line of defense to protect your building. Shingle Residue: Shingle residue in the gutter or on the ground is a sign of excessive roof wear. Mildew or Mold: Mildew and mold on the roof can be a serious problem. However, sometimes all the roof needs is a good cleaning. What About Different Roof Types? Tile: Broken or cracked tiles need to be replaced. Wooden Shingles: Look for signs of termites or other wood-boring insects. Asphalt Roof: If there are multiple layers, your newest one needs to be 10 years old or newer — to assure it remains insurable. Once you have gone through this checklist, if you see areas that need repair or have more questions than answers, reach out to Premier Works. We offer all types of exterior facility maintenance. Our experts have skills ranging from roof repair to brick repair to painting — and many other services. Call or contact us today and let us help you keep your building in good repair — now and for the future.